There are many factors that affect a person's metabolism including age, weight, hormonal changes, lean muscle mass, diet, genetics, stress and the amount of physical activity undertaken on a daily basis. 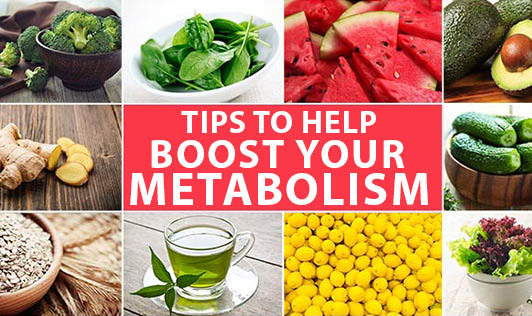 Here are some tips to pep up your metabolism. Build Lean Body Mass. Lean muscle burns calories and the more you have the more calories you burn, even while resting. You can build muscle through resistance or weight training at least twice a week. Eat Breakfast. Many people ignore eating breakfast. What they do not realize is that it is the most important meal of the day. Breakfast gives your metabolism a boost and provides a consistent energy supply throughout the day. Get a Good Sleep. There is research that shows that people who do not get sufficient sleep tend to gain weight. This may be because the body uses sleep to heal and regenerate itself, including its muscular system. Drink More Water. Water is the lubricant of the body. It also flushes toxins out of the body and keeps the kidneys operating at maximum efficiency. Eat Small Meals. Eat 5 to 6 small meals per day. This gives the body a steady supply of energy and prevents binge eating. Do not Miss Meals. Skipping meals in order to lose weight is counterproductive because it actually slows metabolism and can lead to over eating. Plan Your Meals. If you have a daily or weekly menu you are much more likely to stick to your plan. Drink Green Tea. Green tea has been shown to boost metabolism. Include more high energy foods in your diet including fruits, vegetables and whole grains. These provide a more balanced energy source and will not cause blood sugar spikes. Boosting your metabolism can be done if you are dedicated to doing it. This does not mean you need to stress over each little thing but if you eat right and exercise you should see a decrease in body fat and a much more energetic and happy you.